Oh sweet! I totally want to take advantage of this. I love the new Oreo candy bars. Well darn why aren’t they doing this at my local wal mart. Hope everyone took advantage of this give a way. Need tall glass of milk. I know my S.O. will love this! Oreos are my favorite store bought cookie. I haven't tried the Mint candy bar yet, sounds like this would be the perfect time. I'll be there to pick up my free candy bar. We are an Oreo family. It's the only cookie we all like. I can't wait to see what the mint candy bar flavor taste like. I have seen this in the store but have not tried it yet. I think chocolate and mint are a match made in heaven so I will be trying it. It is definitely something I know I would enjoy. Omg!!! Oreo + mint??? I love oreo and I love everything with mint. Fainting now.. haha.. i will surely check on this. Wow, thanks for the heads up! I have never tried the oreo mint yet and I am sure its delicious too! I need to see the nearest walmart to check this out. I wish I could get this, would really take the advantage. I had no idea Walmart had freebies! I LOVE chocolate and mint! I am snagging this and thank you for the heads up! I've been wanting to try these! I hope our Walmart is doing this, too! 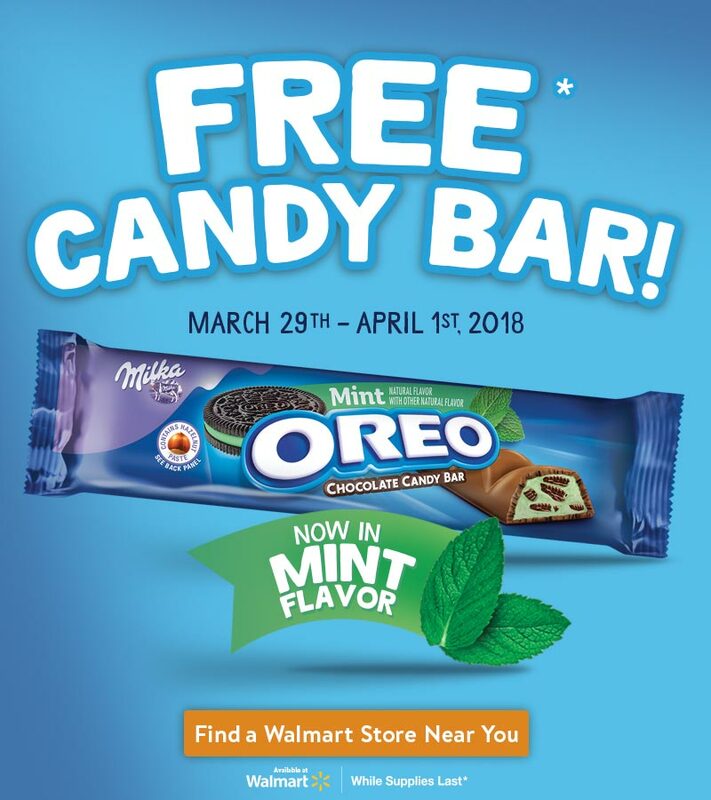 Oreo & Mint?! Yes, Please! Can't wait to visit my local Walmart and take advantage of this offer. Thanks for sharing! My kids love oreos, I am sure they would like this as they like mint flavor as well. I bet this is refreshing! I think I saw these being advertised on TV. They look really good. These sound so tasty! I love all things mint & oreo! I can get down with some Oreos. They are my favorite cookie! Oh wow, this sounds so good! Mint and oreo combined is right up my alley. I am at Walmart literally like 3-5 times a week, it's 2 minutes away so I'm always running in for odds and ends. During this demo, I may make some extra trips lol (don't judge) These sound so good! I'm not a big mint with chocolate fan but my daughter would LOVE these. She adores that combination and Milka chocolate is her favourite. I need to find some of these for her Easter basket. This is such an awesome idea! I bet they taste really delicious as well, definitely an oreo bar I would like to try. I love when we are at Walmart and there's a sample. My kids just love giving something new to try. This is such an amazing promotion. I never knew that they had anything like this from Oreo. Looks amazing! That Oreo flavor sounds really yummy! I love to double check that so we can try it out. What? I didn't even know about this flavor! I love everything OREO. Will have to see if it's available in our area. My husband and youngest daughter loves chocolate and mint together. I can't pass up this savings and must give it a try too! I would love to try these Oreo Mint chocolate candy bars. Thanks for sharing. If only I lived in the US! I'm a UK girl and we don't have Walmart's. DOH. Would love to try these though!